Does your business depends on data stored in your computer or server? If your business depends on data stored in your computer or server, then data backup and business continuity is a must. Can your entire business afford to be down for a few hours or even days? Likely not! Uptime Technologies offers data backup, disaster recovery and business continuity plans through our Cloud services offerings that meet your specific business needs. Whom do you call if data disappears? Do you have a person within your company who knows what to do if a virus attacks your company emails and files? Do you have a data backup plan in place to defend your data against a crypto-ransomware virus? Our team of engineers will work with you and assess your company’s IT and Business Continuity needs. We offer several Local and Cloud Based Data Backup and Disaster Recovery plans, as well as, high availability Cloud servers, that limit the amount of downtime to your business based upon your budget. 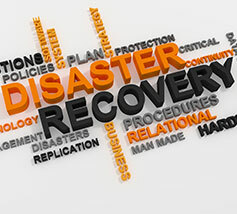 Contact Us for a free data disaster recovery analysis. No longer worry about downtime from a fire, theft, crypto-virus, or hurricane. No longer worry any about losing data related to your valuable client projects or your company’s financial services. Uptime Technologies fortifies your data backup and business continuity plan and provides a proven way for your business data to be secure,to be restored quickly, keep your business on-line without any downtime.